Demonstration at the base from which Britain’s armed Reaper drones are controlled. It is on the A607, 5 miles south of Lincoln and served with a regular bus route. We will be marking 10 years of the Reaper and saying it is time to sow the seeds of peace so bring seeds – flowers – anything which conveys the need for peace. Join us! Maya Evans will be touring Yorkshire giving talks about Afghanistan and about drones. Contact us if you would like to book her. Let us know all about it and we will put it up here. On 6 July groups and campaigners from across the UK are going to Elbit’s factory in Lichfield (north of Birmingham) to demand that the UK stops arming Israel and that the factory ceases production of armed drones and starts manufacturing socially useful goods. Elbit Systems manufacture drones that are used by the Israel Defense Forces in Gaza as well as in other places. Bring banners, Palestinian flags, red, green, black and white ribbons to tie on the fence and kites. More information on facebook. National Bird is a documentary exploring the human cost of America’s drone war at home & abroad through the stories of three ex-US Air Force whistle-blowers. Executive produced by Errol Morris & Wim Wender. On a special visit to the UK author, founder of CODEPINK and leading US anti-war activist Medea Benjamin will be talking at Hamilton House (Fifth Floor), Stokes Croft, Bristol BS1 3QY on ‘The U.S. in the Middle East: Wars, Deals & the next President’. She will have copies of her new book ‘Kingdom of the Unjust: Behind the U.S.-Saudi Connection’. Her previous books include: ‘Drone Warfare: Killing by Remote Control’ (2013) and ‘How to Stop the Next War Now: Effective Responses to Violence and Terrorism’ (2005). Event organised by Bristol STW. We’re delighted to bring you a new briefing on the proliferation and dangers of armed drones, including suggestions of what you as a group or individual can do to take action. The U.S. is turning Croughton into one of its’ largest international intelligence hubs. This base supports many U.S. military sites in Europe and is involved in world wide war operations. These include space communications, data links, military drone information, bomber guidance, missile defence, diplomatic communications and command and control war fighting functions. ‘RAF’ Croughton main gate – on the B4031, off the A43, 2 miles North of M40 junction 10, just South of Brackley, Northamptonshire. Food stall and disabled toilet at the main gate. Bring flags and banners! 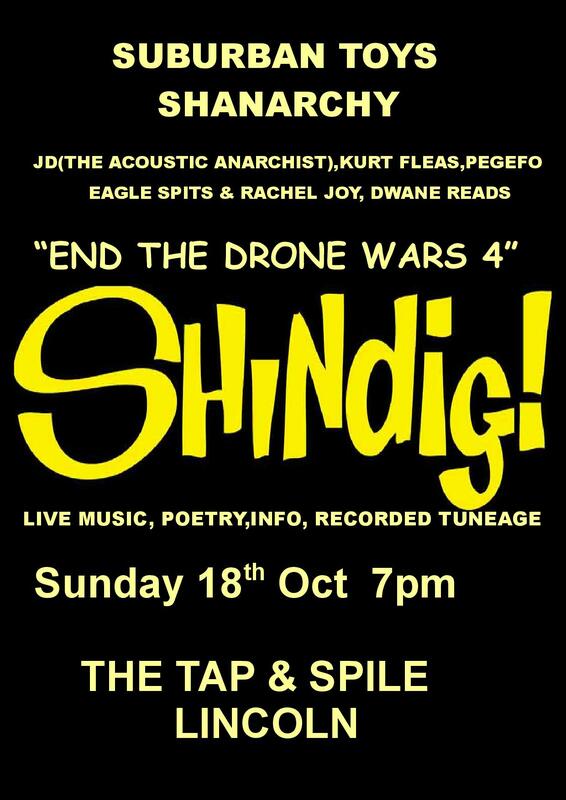 Speakers include Chris Cole (Drone Wars UK) Lindis Percy and Paul MObbs (CroughtonWatch). Minibus leaves St. Giles, Oxford 10.45 & Oxford Rail station 11am. Tickets £8 – pre-booking essential – 01865 248357 / oxonpeace@yahoo.co.uk. Organised by Oxfordshire Peace Campaign. This is the base from which the British armed Reaper drone is controlled. We are calling this demonstration ‘We Are Watching You’. Please bring oversize glasses, binoculars, telescopes, anything to make the point that what they are doing is not going unnoticed. The base is on the A607, 5 miles south of Lincoln and just north of the village of Waddington. The no.1 bus from Lincoln to Grantham stops nearby. Fly Kites on the beach opposite the Carlisle Pub on the sea front from 11am for as long as the weather conditions suggest. Please bring binoculars, telescopes, massive specs, night vision goggles – anything which reinforces the message to RAF Waddington, and drones manufacturers and operators the world over, that “we are watching you”. Get the number 1 bus to Grantham from Lincoln bus station – just opposite Lincoln train station. It stops at the base, just before the village of Waddington and runs every half hour. You can download the flyer to print and distribute by clicking here. The UK’s Watchkeeper drone has been developed under a £1 billion joint venture contract awarded by the Ministry of Defence to Thales UK and Israel’s Elbit Systems, allowing the UK military to benefit from technologies that have been ‘field tested’ on the Palestinians. The Crawley factory is one of Thales’s largest facilities in the UK. Bring banners and other displays for a lively visual impact at the factory’s surrounding fence! Protesters local to the Elbit factory at Shenstone near Lichfield will also be demonstrating there on Friday 8th April from 11am. see here for more details. There will be a demonstration at RAF Waddington a year after 4 protestors cut through the fence and closed the base down for over an hour. Since then the armed Reaper drone, controlled from the base ,has continued to bomb people in Iraq and Syria and also carried out its first targeted killing in August. The demonstration will be at the gate on the A607, 5 miles south of Lincoln. The number one bus from Lincoln to Grantham runs half hourly and stops near the base. There are plans for quarterly demonstration at the base during 2016. Later dates to follow. After a full two days of well argued defence that they went into RAF Waddington in January in order to prevent crimes against civilians in Syria and Iraq, the four defendants were found guilty and given a two year conditional discharge plus costs. Organisations and individuals throughout the UK will be doing actions, events and lobbying from 3rd to 10th October 2015. This will include a big demonstration on Saturday 3rd October at RAF Waddington, base of the Reaper pilots. The Saturday demonstration, titled ‘Scones not Drones’, will be from 12pm – 3pm. There will be lots of activities, including Skyping with campaigners in Afghanistan, a picnic, flying ‘kites not drones’, and speeches. 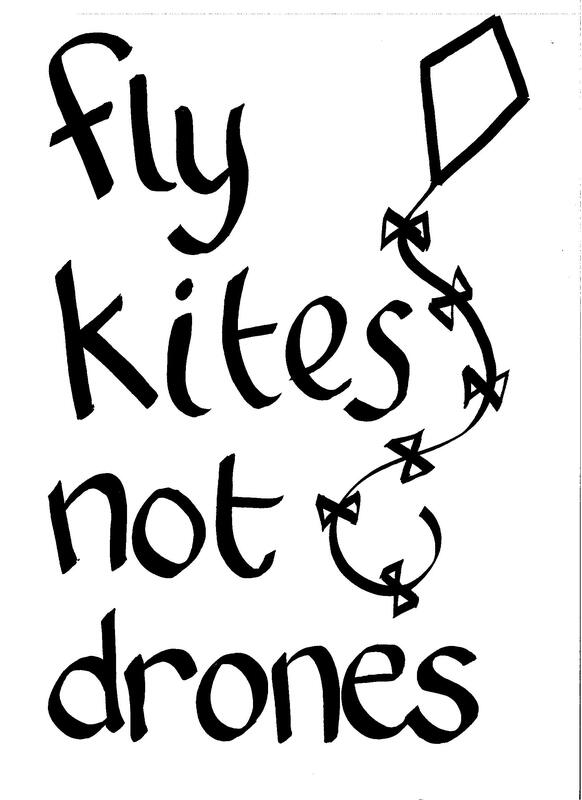 Bridport Quakers will be taking ‘Fly Kites Not Drones’ to the Eggardon Kite Festival. This is the day before Peace One Day on 21st September. 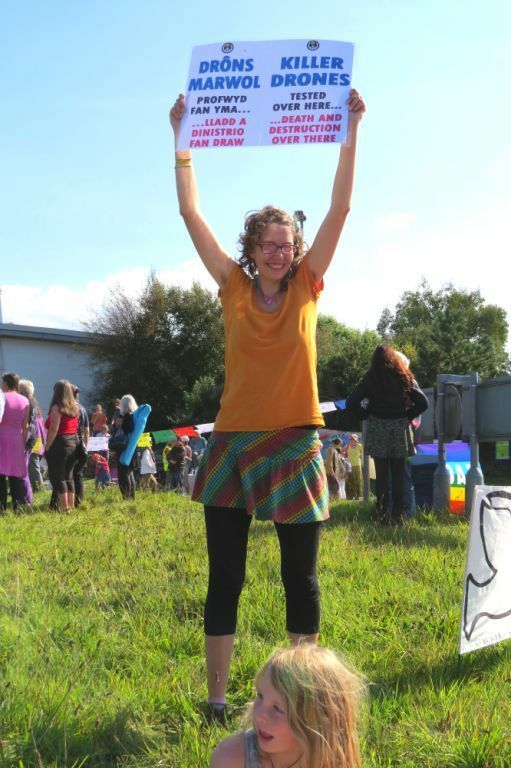 Awel Irene from Porthmadog FoR and three other drone protesters will be in court at Caernarfon Magistrates Court, for painting on the runway at Llanbedr Airfield ‘No death drones’ in June 2014 (more details on the action here). The case will be heard through the medium of the Welsh language. Big day of action against the biennial DSEI arms fair in London, which runs 15th – 18th September. 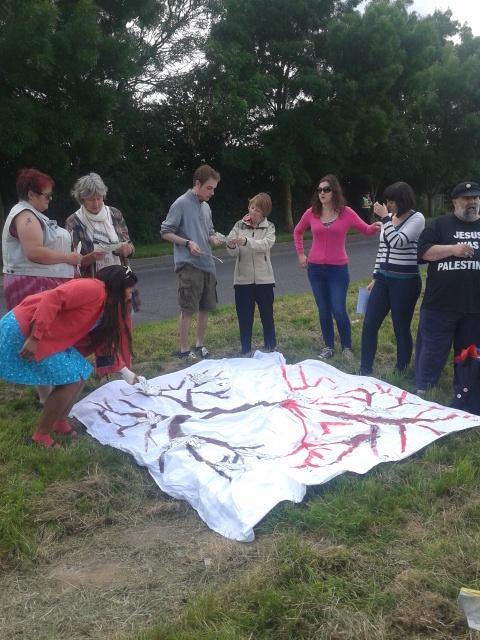 At Burton on Trent there is the pre-trial hearing of the 19 people arrested at the Elbit protest in Shenstone on 6th July, for breaching an injunction. They have now been charged and at this court appearance the trial date will be set. Supporters welcome from 9.30am at Burton on Trent magistrates court. Meanwhile on the same day there will be a vigil at the Elbit factory in Shenstone, between 10am – 12 noon, to both assert the right to protest and in solidarity with those killed and injured in Gaza by Elbit drones. For details, contact info@boycottisraelnetwork.net for more details. The injunction was amended at an interim hearing on 22nd July, so that only trespass onto Elbit property and intimidation of workers remain. A further hearing will take place in the autumn, date not yet known. There has already been a vigil at the site following the amendment. 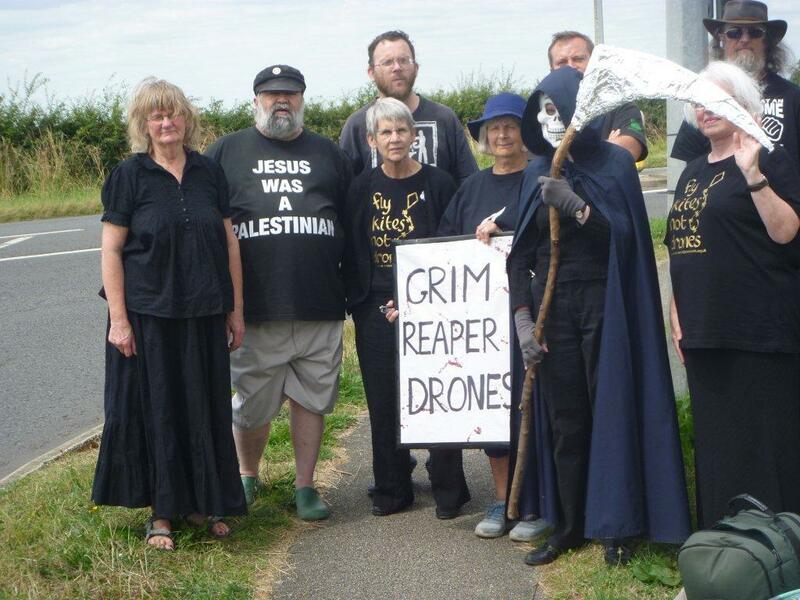 On 30th July, a group of people from local churches and faith groups and Queens theological college, Birmingham, gathered to protest at the making of drone engines and to remember Professor John Hull from Queens who had tragically died the week-end before as a result of a fall. He was much loved and a passionate anti-drones campaigner. 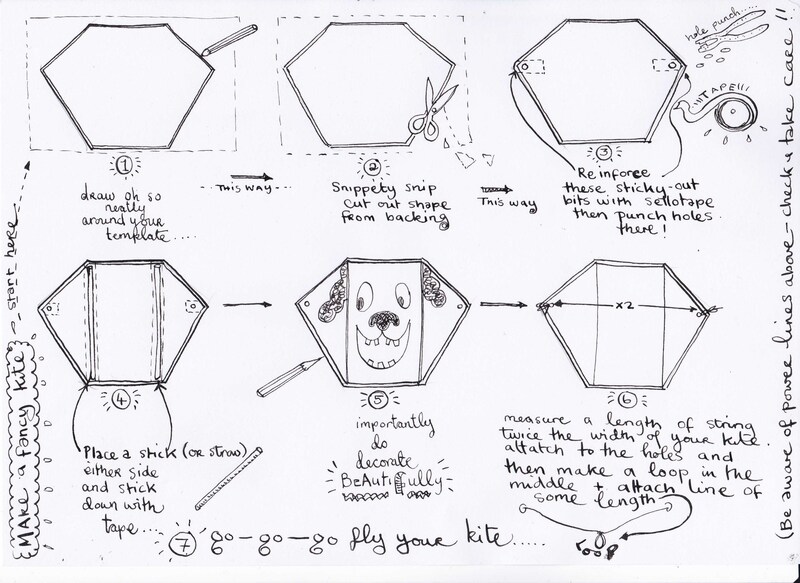 Greenbelt festival this year features Fly Kites Not Drones, with workshops running in the Quaker dome and kite flying on Sunday. The conference will explore how drones are creating perpetual war. It will be held at Friends House, Euston Road, London from 11am – 4pm. The day will feature panels, workshops and networking. Last year saw the first ever Drone Against Drones event, a street action designed to highlight the menace of armed unmanned aircraft. A group of people armed with musical instruments gathered on Hastings seafront and played, or sang, sustained notes for as long as they could. The resulting drone drew the attention of passers-by and gave an opportunity to raise awareness of this issue, and create a media splash. 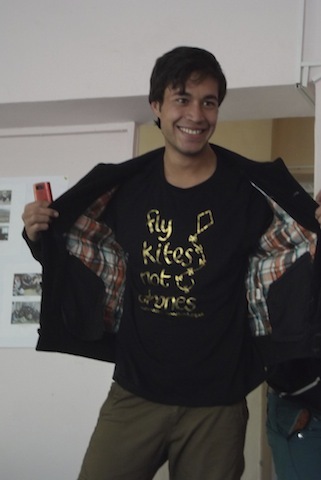 Raise a kite to the sky for all the children around the world who have to live under the threat of drones. Stop High Tech Terrorism with some simple kite flying! Can you make it to our kite flying demo at RAF Waddington, home of the Reaper pilots, from 1pm – 3pm? Instructions on public transport links to the base can be found on our What is RAF Waddington page. So far we know there are events in Argyle, Axbridge, Bournmouth, Brighton, Dunblane, Edinburgh, Findhorn, Hastings, London, Loughborough, Manchester, Sheffield, Southampton, Stockport and Waddington. Here is an advance photograph from Quakers in Bournemouth! Join us at RAF Waddington from where the armed Reaper drone is controlled from 1pm until 3pm. The base is on the A607 five miles south of Lincoln and has good public transport links with a half hourly bus – the Lincoln to Grantham no. 1 bus. There are now 8 Reaper drones in Afghanistan and 2 being used over Iraq. The theme this month will be ‘Now killing in Iraq’ . Wear warm clothes as the wind there is very fierce. We in Wales will be joining others across the world to mark this year’s International Day of Peace by campaigning against militarism, war preparations and armaments with a particular focus on drones at Aberporth and the Trident nuclear weapons system and its replacement Drones are currently being ‘tested’ for the British army at Aberporth in Ceredigion, west Wales and this will be the venue for the main protest on Sunday 21st September. ‘Warm up’ events in Cardigan town will take place on the previous day. Details: 1. Saturday 20th September Cardigan Guild Hall Steps 11.00am – 1.00pm Vigil/Leafletting Following the successful recent anti-NATO Vigil at Cardigan Town Hall, this event will focus on the military drones at Aberporth, Trident and its replacement, anti-militarism and war in general. Contact Bob Doyle: bobdoyle70@yahoo.comAt 12.00 midday there will be a special (and beautiful) ‘Drape the Drones’ focus at the same venue with ‘Wool against Weapons’ knitting on display, singing and bubbles! It is hoped that, following these Guild Hall steps events, the good folk of Cardigan will be better informed about the issues and feel encouraged to come to the main event on Sunday.2. Sunday 21st September. Entrance to Parc Aberporth Drones ‘Centre of Excellence’ (sic) (as signed from the main road A487) Postcode: SA43 2BN 11.30am Assemble 12.00 midday – 1.00pm This positive event will include songs, poems, (brief but passionate) speeches, music followed at 1.00 to 1.15pm by a knitted photo call around the roundabout at the entrance as above and, with your help, a noisy finale. The drone watch at RAF Waddington near Lincoln, from where the armed Reaper drones are controlled, falls on Peace One Day this month. We leave you to interpret that in any way you want, but be as visual as you can. The base is on the A607 5 miles south of Lincoln. September 21st is a Sunday but there is still a useful bus service. The No.1 bus to Grantham leaves Lincoln Bus station (near the train station) at 12.45 and returns at 15.04. There is a bus stop outside the base. 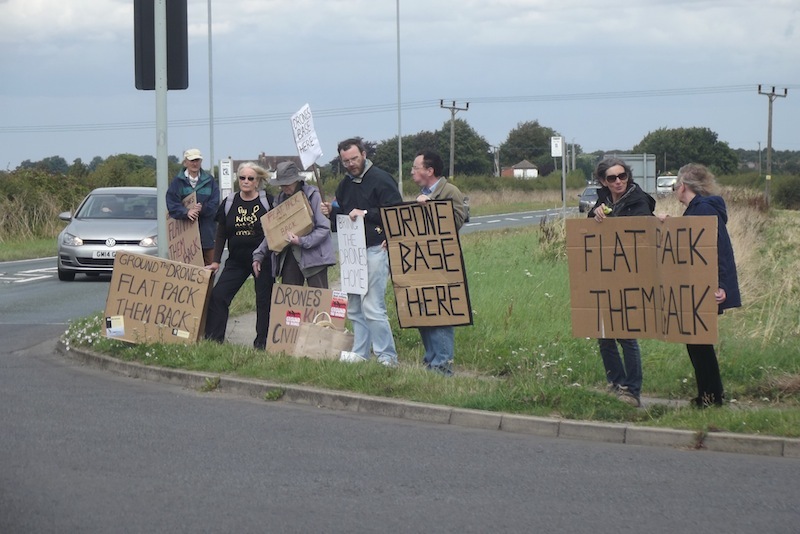 Last month for ‘flat pack them back’ – see below – there were fewer of us than usual but we had a huge impact because there was an air show on a and a continuous stream of cars going into and later out of the base. 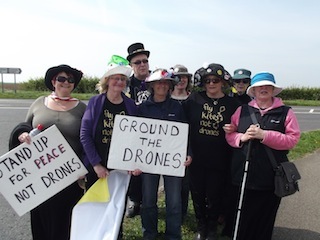 Drone Watch Waddington 123 on June 21st will be Faith Watch Waddington. Join us at the RAF base at Waddington near Lincoln from 1pm – 3pm on Monday 21st April. Because this is Easter Monday you may want to wear an Easter Bonnet – as bold and imaginative as you like! The RAF base is on the A607 between Bracebridge Heath and Waddington and even though it is a bank holiday the no. 1 bus to Grantham is still running – it leaves the bus station at 12.45 and returns at 15.04. The bus station is just opposite the train station – a bit to the right – and the bus stops right near the base. For more information contact Penny on 07414 465695. Some of us in bonnets below. In solidarity with people in Afghanistan at their new year there will be ‘fly kites not drones’ events happening around the country. e. London 2pm Speakers Corner Hyde Park. Led by VCNV and the feminist protest group ‘The Activettes’ this is a child friendly event. Bring a kite! g. Oxford 2pm-4pm in Bonn Square. Bring a kite! And there will also be kite flying in other parts of the world including North America, Sweden and of course Afghanistan. 16th February: Join Bristol Against Arms Trade for an interactive and hands on all-dayer of skill sharing, where you can learn all the tricks of the trade and meet some fellow campaigners in the process! Drones feature in the day with a talk by Corporate Watch about their recent fact-finding tour of Gaza interviewing the families of victims of Israeli drones and the effects that ‘drone seige’ has on the people. 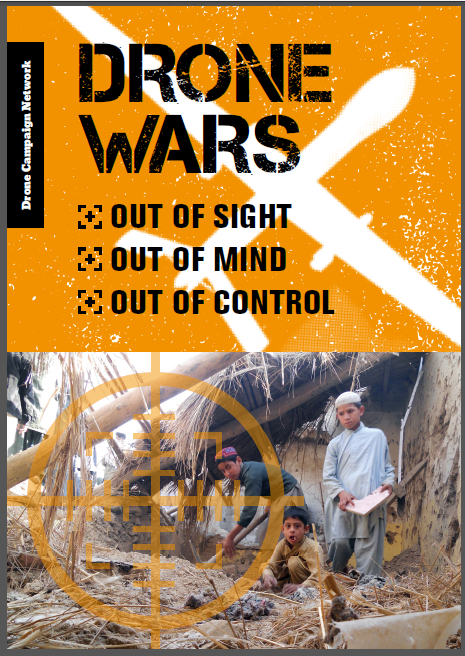 Drone Wars UK will present their their recent report on Israel and the Drone Wars. 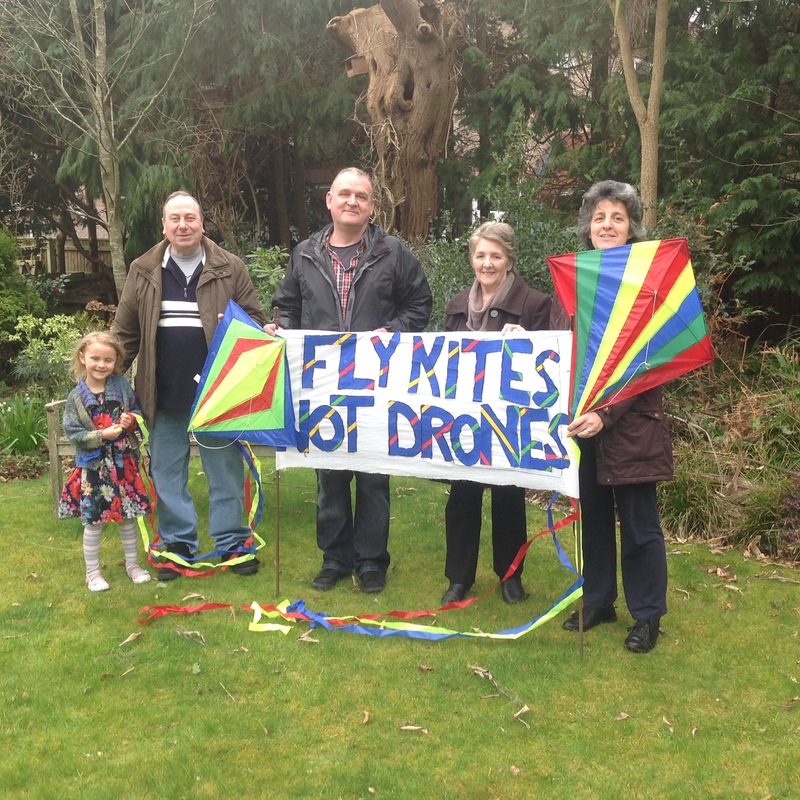 Planning local and regional ‘Fly Kites not Drones’ actions in support of Afghan victims of drone warfare on Saturday 22nd March, and joining the vigil at RAF Waddington 21st March with promotion of Global Days of Listening skype with peace activists in Kabul. A great opportunity to brainstorm ideas for future protests and keep the momentum going after the successful action blocking access to the DPRTE fair held at UWE which made Bristol’s stance on the arms trade very clear.At a central Bristol venue – Everyone welcome! Email bristolagainstarmstrade@gmail.com to find out more. Come and join us any time you can. The Drone Campaign Network’s Week of Action is part of International Keep Space for Peace Week. Here is a list of events so far – to let us know of an event not listed here please email us info@dronecampaignnetwork.org.uk. Please consider organising an event in your area focusing on the use of drones. UK tour – by members of the Waddington 6, Brian Terrell and members of Voices for Creative Non Violence who have been to Afghanistan and seen the effects of drones on the Afghan people. They will also have the huge Fellowship of Reconciliation quilt – 13 metres by 2 metres made up of panels of people killed by drones in Pakistan. Contact: pennywalker@riseup.net if you would like them to come to your area. RAF Croughton, Oxfordshire. Rally at U.S. satellite communication base, March to main gate 1 mile – starts Croughton village 12.00 midday, Returns 3:00 pm. Birmingham. Public meeting “The Military use of Drones” at Queens College, 7.30pm with Brian Terrell. More details: Drones Public Meeting Queens 7 October 2013. Lincoln Magistrates’ Court. Trial of the Waddington 6 begins. The 6 entered the RAF base in June and have been assured that their arguments will be listened to in full and they want to use the trial as an opportunity to get as much media coverage as possible for ‘Putting Drones on Trial’. They will be using the recently published paper by Public Interest Lawyers about the illegality of drones. Menwith Hill, North Yorkshire. Demonstration at NSA Spy Base focusing on drones in particular and US missile defense in general. 6-8 pm. Sponsored by CAAB. More details: mail@caab.corner.org.uk or 01423 884076. Coventry. The Real Cost of Drone Warfare – with Maya Evans & Penny Walker, Friends Meeting House, Hill St. Coventry CV1 4AN, 7.30pm – 9pm. Exeter: The Real Cost of Drone Warfare – with Maya Evans & Penny Walker, Exeter University Amnesty, Harrison Building, Exeter University, 6.30pm. London. Afghan Peace Conference, organised by Voices for Creative Non Violence. Friends Meeting House, Euston.